Under the direction of Ashley Wheeler and Margaret York, with musical accompaniment by Sharyn and Scott Walker and Debbie Lunn, the production drew a large crowd Saturday evening for their second of two shows. Alex Walker did an exceptional job playing dual roles as both “Mufasa,” the wise king of the jungle and his son, the adult “Simba” character, delivering powerful solos in the show. Walker’s brother Luke, played the dastardly lion “Scar,” and did a remarkable job channeling his best Jeremy Irons’ impersonations in the delivery of both his lines and singing abilities. The Walkers are from Greater Houlton Christian Academy, but performed with the Hodgdon students. Jade Akins handled the role of young Simba and shined during her solo, “I Just Can’t Wait To Be King.” Madison Smith played the role of young Nala. Aside from strong vocal performances, the production also featured its fair share of humor, particularly from the characters of Timon and Pumba. Ashley Shaw played the part of Timon on Friday, while Matthew Lufkin took over the role for Saturday. Hannah North was a scene stealer throughout as the comical warthog Pumba. Others in the production were Joseph Scott, Serena Lukfin, Brooke Wheeler, Samantha Shank, Katie McQuarrie, Kennady Wright, Reiley Wright, Sabra Scott, Mallory Williams, Faith Howland, Kyla Morrison, Alaina Campbell, Justus Scott, Brody Rouse, Katie Ledger, Ashley Shaw, Monique Polchies, Aidynn Woods, Oisin Gardner, Jersie Valiante, Trinitee Neher, Hayden Crowley and Hannah Little. 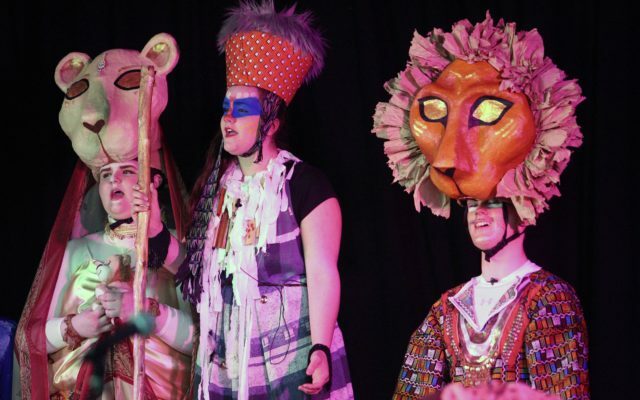 The show featured elaborate African masks and artwork created by Hodgdon Middle-High School teacher Stacy Ramsey, as well as beautiful costumes designed by several staff members and parents. It marks just the second performance for Hodgdon students and the first to incorporate high school members. Last year, the school brought drama back to the district with its production of “Alice in Wonderland,” which featured a massive ensemble cast of 40 students.